What pops into your head when you hear “attachment parenting”? Baby-wearing? Co-sleeping? Attachment parenting is a parenting style that promotes maternal-child bonding between mother and baby as early as possible in a child’s life. Infants are vulnerable, needy little creatures and ideally, new moms are ready to nurture them. The goal is to establish trust right off the bat, setting the tone of the parent-child relationship. Sounds warm and fuzzy, right? For a child adopted as an infant, attachment parenting probably doesn’t look much different, but what about older children? Foster care adoptions and the majority of placements through non-domestic programs (e.g., China, Ethiopia, Bulgaria) usually aren’t babies. 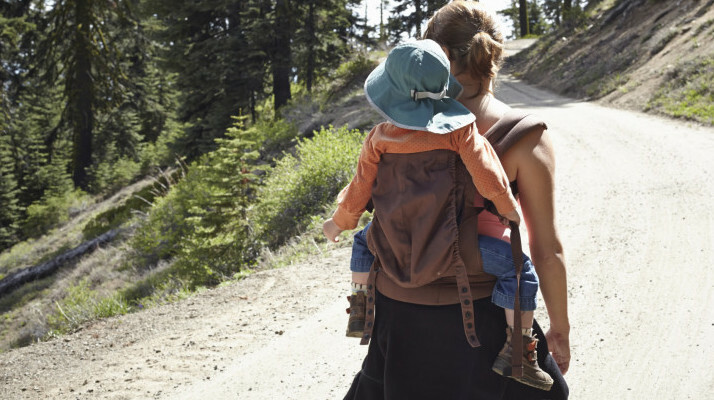 For these nontraditional families, attachment parenting sometimes looks different. We attempted to use an Ergo carrier to promote skin-to-skin closeness that parents of newborns experience organically. Uh… not so much. A wiggly toddler wasn’t down with being squished against a stranger when there were so many things to see and explore. Plus, lugging around a 25-pound kid was murder on my back. The sling was a moderately helpful alternative to a stroller at times, but we pretty quickly ditched it as an attachment tool. Cocooning means keeping a child’s world small: not venturing outside unless absolutely necessary and limiting visitors. Newly adopted kids, especially older children, might see anyone who shows them attention as a parental figure. If I child is bombarded with Mom, Grandma and Aunt Carol, confusion (and behavior problems) might stem from lack of clarity on who’s who. Some families even set limits on social interaction outside the immediate family for short periods of time. While we didn’t cocoon, we did limit situations where our little guy would be overwhelmed by new people. We didn’t have company and avoided large groups of people for a few weeks, but we didn’t hunker down at home. I had limited maternal leave so our son needed to get used to other people. Besides, staying home 24/7 would have made me crazy and I decided my kid didn’t need a crazy mom. Bedtimes can be rough — especially for young kids who might be struggling with the “what just happened here?” feeling. We’re at our most vulnerable when we lay down to sleep, and kids may struggle with memories of their old routine or miss their caregivers. Letting a child whose place is established in your family “cry it out” may be something you’re OK with, but a newly adopted child might just need extra reassurance that you’re nearby and that they’re not alone in this unfamiliar place. Parenting might look different for a new adoptive family as they navigate their new normal. We took our cues from our kid, applied a lot of trial and error and a little common sense and found what worked for us… and that’s no different from any family out there. Attachment parenting applied by an adoptive family may look strange, but who really get to decide what’s normal, anyway?